The New Zealand dairy herd is comprised predominantly of Holstein-Friesian, Jersey and Holstein-Friesian-Jersey crossbreed cattle. While a Jersey calf is easy to identify, both the Angus-cross and Holstein-Friesian-Jersey calves may have a completely black coat, making it difficult to identify the breed of new-born calves. The experiment aimed to identify whether tongue colour could be a useful predictor of breed in Angus-cross-dairy and dairy-breed calves. 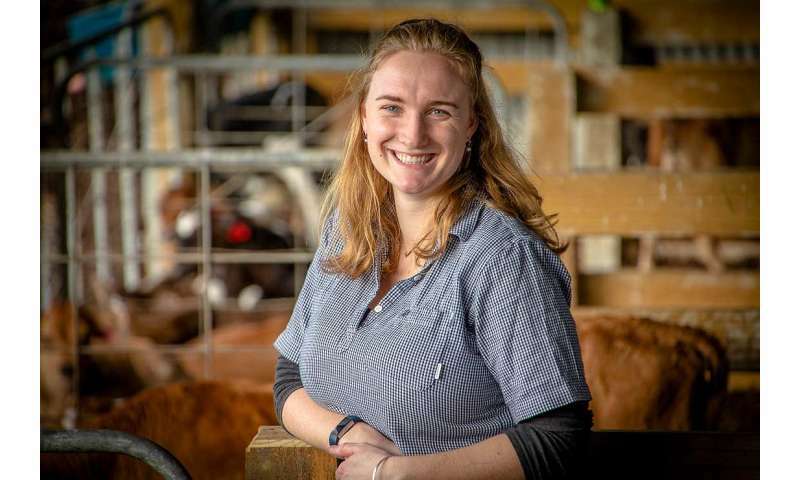 Ph.D. student Lucy Coleman led the research after an Angus breeder had noticed the tongue colour trend. "Identifying the breed of calf prior to four days of age is important, so that the dairy farmer is able to retain appropriate dairy-breed heifers as replacements, and dairy-beef calf rearers are able to purchase beef-cross calves for rearing. The best option for identifying breed is DNA testing for parentage. However, this is expensive, and results take longer than four days to obtain," she says. "Holstein-Friesian cattle possess a gene which causes the white patches in the coat and a pink coloured tongue, whereas Angus and Jersey cattle lack this gene and have black tongues. So we wanted to see if the colour of their tongues could be an indicator of breed." An initial study of the tongue-colour of 476 Angus-cross-dairy and dairy calves shortly after birth was conducted as part of Miss Coleman's Ph.D. project. The findings showed that selecting calves to rear for beef solely on having a black-coloured tongue, would correctly identify 73 per cent of Angus-cross calves, and 90 per cent of dairy-breed calves. "The initial study provided useful clues for breed identification, however was not infallible as the occurrence of spotted tongues raised an issue of whether to keep or sell that calf," Miss Coleman says. A second study was conducted the following year, recording the presence of horns and tongue colour of 418 Angus-cross-dairy and dairy calves. The majority of dairy calves (95 per cent) had horn buds present at birth, while none of the Angus-cross calves had horn buds, indicating that horns were exclusive to the dairy breed calves. The outcome of the second study, provided separate recommendations for dairy farmers, and calf-rearers buying beef-cross-dairy calves. Advising dairy farmers to keep only calves with horn buds as replacement dairy heifers, meaning no Angus-cross calves would be incorrectly identified and kept. 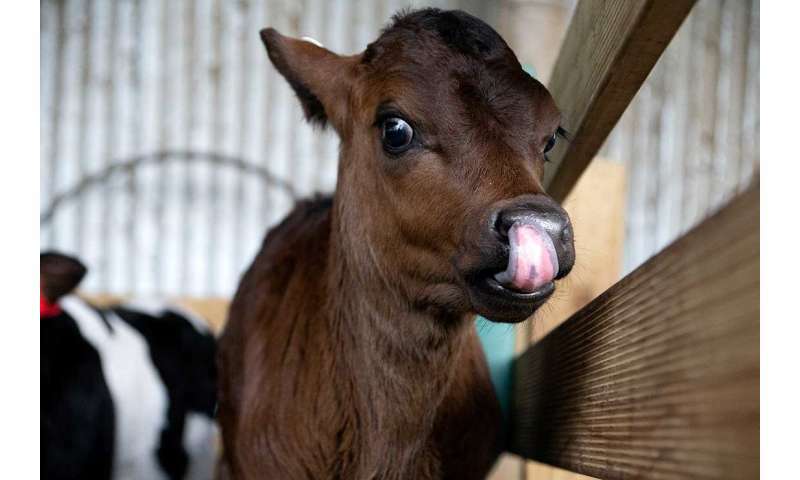 For calf rearers, the recommendation was to buy only calves without horn buds (polled) and with a black tongue which greatly reduces the chances of inadvertently purchasing dairy breed calves. The experiments were conducted with calves from the Beef+Lamb NZ Genetics dairy-beef progeny test based at Limestone Downs farm in Port Waikato. The first study, titled Breed variation in tongue colour of dairy and beef-cross-dairy calves was co-authored by Professor Hugh Blair, Professor Nicolas Lopez-Villalobos, Dr. Penny Back and Associate Professor Rebecca Hickson of the School of Agriculture and Environment.